Complex salads are tossed salads that have more than one ingredient. A great example is the classic Italian Tri-Color Salad, which uses three peppery lettuces: arugula, radicchio and Belgian endive. Pair with a balsamic vinaigrette; the sweetness of the balsamic is a delicious foil for the bitterness of the lettuce. Oftentimes this salad is topped with shavings of Parmesan cheese. 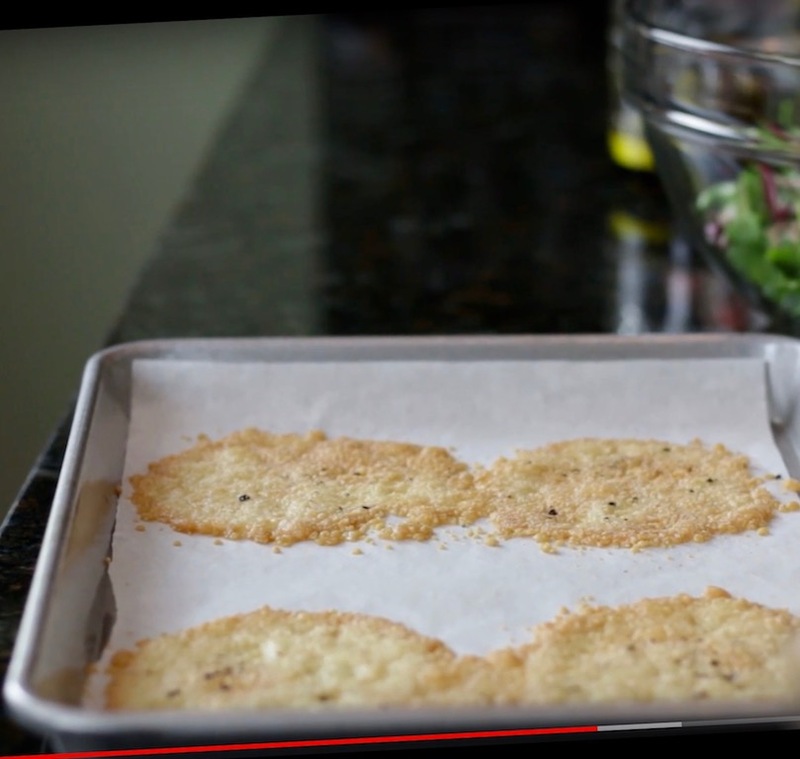 I thought it would be nice to share a little twist on that — Parmesan crisps! Use 2 tablespoons grated aged cheese, such as Parmesan or Asiago, per person. Drop onto a lined baking pan and use the back of the spoon to spread into a circle. Finish with a little freshly grated black pepper, if desired. Bake in 400 degree oven for 12 minutes, or until lightly golden. Cool and add to salad or a bread basket. Watch the Tri-Color Salad Video here. Here’s a classic Italian salad using arugula, radicchio and endive with a balsamic vinaigrette. Special bonus – cheese crisp recipe included. Drop 2 tablespoonfuls of grated cheese onto the lined baking sheet about 2 inches apart. Spread the cheese into a circle. Sprinkle with a little freshly ground pepper, optional. Bake in preheated oven for 12 minutes or until lightly golden. Place the olive oil, balsamic vinegar, garlic, salt, and pepper in a sealed jar. Let sit, refrigerated, for at lease 30 minutes. Can be made a day in advance. Remove the garlic before using. Place the arugula, radicchio and endive in a salad bowl. Season with a pinch of salt and a couple of turns of the peppermill. Remove the garlic from the vinaigrette, reseal the jar and shake well. Pour sparingly over the greens and toss. Garnish with shaved aged cheese, such as Asiago or Parmesan, or cheese crisps. 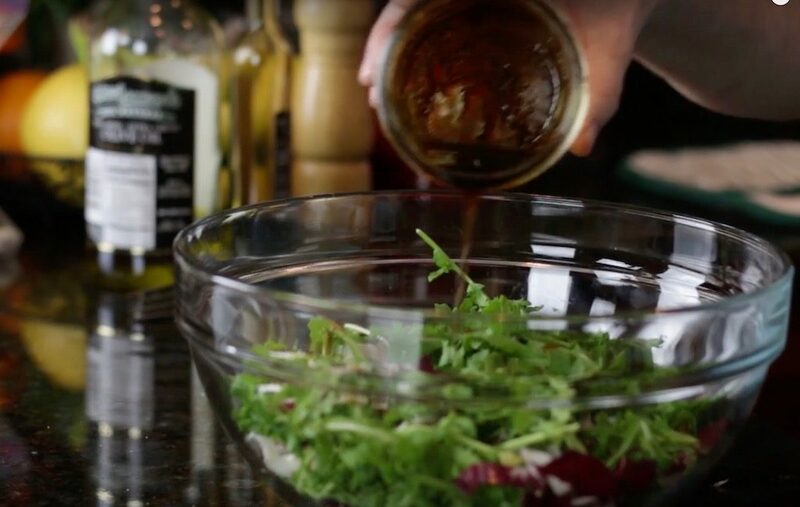 Use just enough vinaigrette to coat the lettuce, but not pool at the bottom of the bowl. Save leftover vinaigrette up to 4 days in the refrigerator.